7 Sep 2018 – “There could be no military solution to the Syrian conflict and it can only end through a negotiated political process. 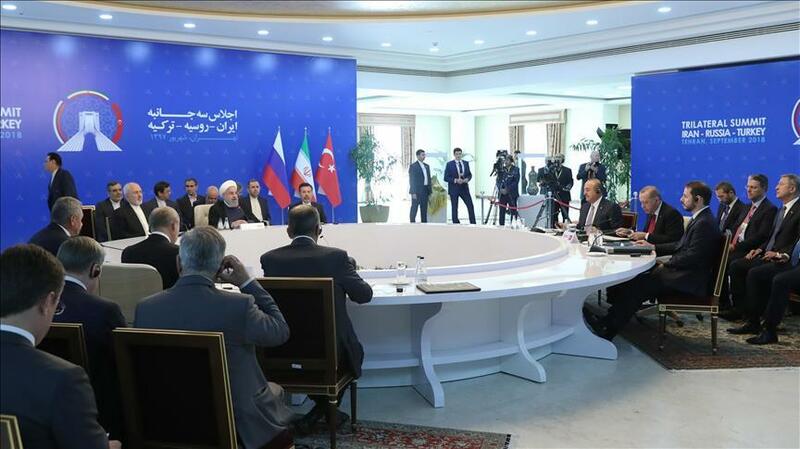 “[They] reaffirmed their determination to continue active cooperation with a view to advancing the political process consistent with the decisions of the Syrian National Dialogue Congress in Sochi and the UN Security Council Resolution 2254,” the statement said. The leaders “rejected all attempts to create new realities on the ground under the pretext of combating terrorism,” while expressing determination to stand against separatist agendas aimed at undermining the sovereignty and territorial integrity of Syria and national security of neighboring countries. Russia, Iran, and Turkey also called for the United Nations and its humanitarian agencies to help Syria by providing additional humanitarian aid. The joint statement also welcomed the progress in the work of the Working Group on the release of detainees and abductees, and handover of the bodies as well as the identification of the missing persons, as undertaken with the participation of the UN and ICRC experts. The next tripartite meeting will be held in Russia, upon the invitation of President Putin.